You're Not Wearing That - Are You!? 1 Take off the garment of your sorrow and affliction, O Jerusalem, and put on forever the beauty of the glory from God. 2 Put on the robe of the righteousness that comes from God; put on your head the diadem of the glory of the Everlasting; 3 for God will show your splendor everywhere under heaven. 4 For God will give you evermore the name, "Righteous Peace, Godly Glory." 5 Arise, O Jerusalem, stand upon the height; look toward the east, and see your children gathered from west and east, at the word of the Holy One, rejoicing that God has remembered them. 6 For they went out from you on foot, led away by their enemies; but God will bring them back to you, carried in glory, as on a royal throne. 7 For God has ordered that every high mountain and the everlasting hills be made low and the valleys filled up, to make level ground, so that Israel may walk safely in the glory of God. 8 The woods and every fragrant tree have shaded Israel at God's command. 9 For God will lead Israel with joy, in the light of his glory, with the mercy and righteousness that come from him. Baruch was the scribe of the prophet Jeremiah and his writings would be from that same time frame (597 BCE). If you can't find it in your Bible, do not fret. It is an apocryphal book of the Bible (not part of main or original canon of the Bible) and is an optional lectionary reading for that reason. 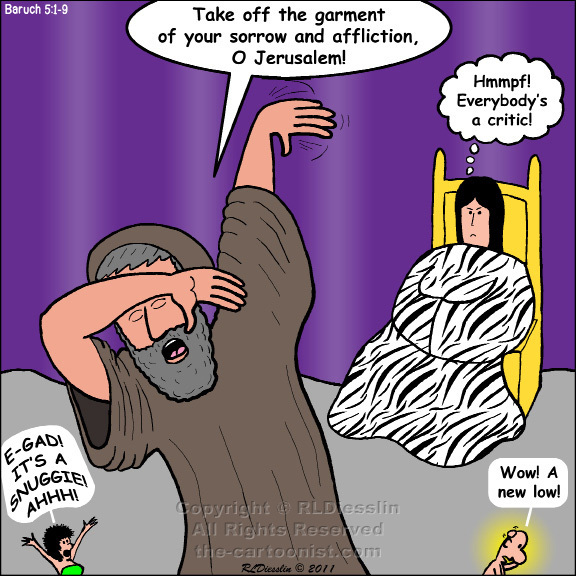 Baruch brings a message of encouragement to the Israelites in exile in Babylon looking forward to the days when they can return to Jerusalem and God will restore them once again. It echoes many of the other prophecies particularly those in Isaiah (40, 43 and 60). Prophets often signal warning in times of prosperity and hope in times of desperation, and this is no exception.